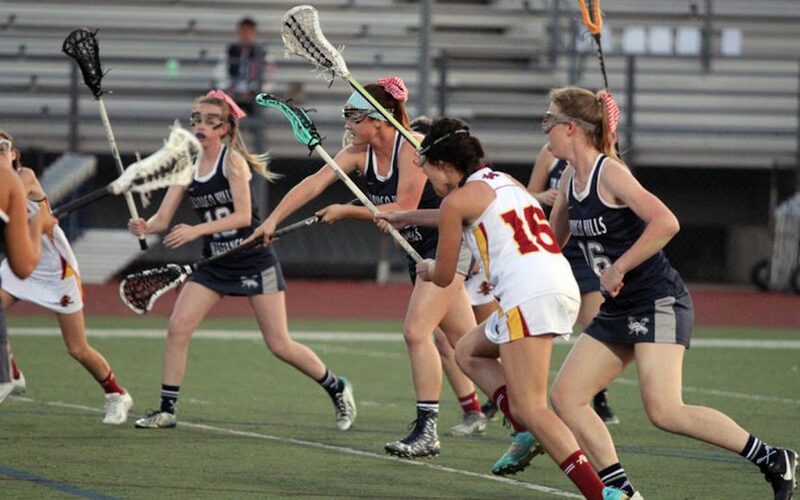 The 2016 season started with a bang for the Trabuco Hills High School Girls Varsity Lacrosse: a 17-4 win on Tuesday against Esperanza at Trabuco Stadium. The Mustangs wasted no time showing they will once again be a contender for a league title, even after losing many great players to graduation. Coming off a weekend scrimmage win over a traditionally strong Los Alamitos team, the momentum carried right into Tuesday night’s match against Esperanza. Six different girls scored goals, with Juliet Mooney getting the first in the opening minutes. Freshman Hennessey Evans played like a veteran as she teamed up with senior goal scorer Kendall Derbyshire throughout the night. Evans finished with at total of four goals. Senior Hannah Moller finished the game with three. Ashley Bell blocked eight of the 12 shots she faced. Only one shot to get past Bell in the first half and four total for the game. Senior Kody Shelton led a deep defense that Coach Scott Leong rotated throughout the night. All contributed to keeping the scoring to a minimum. Next up for Trabuco Hills (1-0) is an away game at El Dorado on Thursday. Esperanza (0-1) returns to the Saddleback Valley for a game with Tesoro on Thursday. Source: trabucolacrosse.com Michelle Mendoza is a graduate of El Toro High School and Chapman University, where she played NCAA D3 lacrosse. Follow her on Twitter @michelledm18.